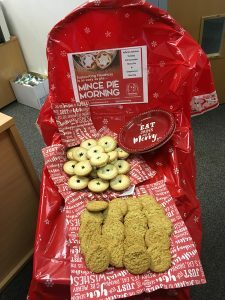 On Tuesday 5th December, Christmas arrived early at Jefferies Solicitors as we held a mince pie and gingerbread morning to help raise money for brain injury charity Headway UK. 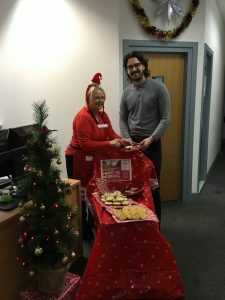 After the success of last year’s event, we were delighted to get involved in the festive fundraising once again. In exchange for a donation, we enjoyed hot mince pies or gingerbread, kindly served by our jolly receptionist Eileen. Overall we raised £48, which, together with the £3170 we raised in June when we took part in Headway’s Corporate Climb up the O2, will go towards helping those who have been affected by brain injury. Sadly, each year, around 350,000 people are admitted to hospital with a brain injury. Headway’s network of more than 125 groups and branches across the UK, is an invaluable resource for those individuals. The organisation provides support, services and information to brain injury survivors, their families and carers. It also works closely with professionals in the health and legal fields (like Jefferies). At Jefferies, our catastrophic injury solicitors have worked with Headway for many years. We know first-hand just how life-changing the charity’s work is for brain injury survivors and their families. Because of this, we are committed to helping raise funds and awareness for the organisation. We are delighted to have collected such a fantastic amount for Headway this year. We look forward to continuing the fundraising in 2018! Our specialist solicitors have helped clients who have suffered brain injuries for more than two decades. We supply not only expert legal expertise to individuals and their families, but also practical help and quick access to essential services and equipment. If you or a family member have been affected by brain injury, get in touch with us for free on 0800 342 3206 for a no-obligation conversation about your circumstances. Alternatively, fill in our online enquiry form to request a call-back from a member of our friendly team.